Using Google Fi for Home Wifi? Google Fi in China - Security concerns? As an iPhone user, all I want is ..
Can I adjust data as I go? Can't Port # To GV, But Can Port To Fi? Is Hangouts required for Google Fi? Texts/photos sent via Hangouts counts as billable data?? RMA started on March 27th has yet to be resolved. I have been lied to, given empty promises, and am now completely fed up. I am hoping to find advice on what course of action to take next. Drawbacks to Google Fi on a Pixel 3 XL without eSIM? This is kind of a lame way to celebrate... Right? Any advice on adding group plan members for a short period of time? Does Fi Make Sense for Me? MintMobile + GV + [paused] Fi: is it possible? Since Google Fi is tmobile if i use a samsung s10 locked to tmobile will it work with fi? Keep having moto problems, giving up but lacking alternatives. Few questions about Google Fi for traveling. How do I activate a data only sim on my phone? Cancellation stuck on pending. Issues with sending SMS messages to Android users from iPhone. Is there any way to see/listen/delete your voicemail on the web? Why won't Google Fi give me my service credits? Will Data Only SIM Work in Phone? How long have you been with Fi? Using Google Fi as a hotspot in Canada. Cannot pause and unpause service outside of the US? Pixel 2 XL, Google refusing to let me transfer device protection onto a new plan. WTF? Does LG Stylo 2 Plus (T-Mobile Unlocked) work on Fi? Does Fi have HD Voice? Will Pixel 3a/3a XL be available for Fi if launched 5/7? Project Fi Ripped me off! So is there no way I can access phone records from 18 months ago? GoogleFi somehow doesn’t store that information? Your work pays for your phone plan. You get to pick one. Which on do you pick? [Pixel 3] Went abroad for a couple of weeks, now that I'm back in the US my phone doesn't receive calls. What happens to members of a group plan when the owner ports out? [newbie] Get phone and cancel? "Send and receive emails over text message" goes to messages and not Hangouts: bug or feature? 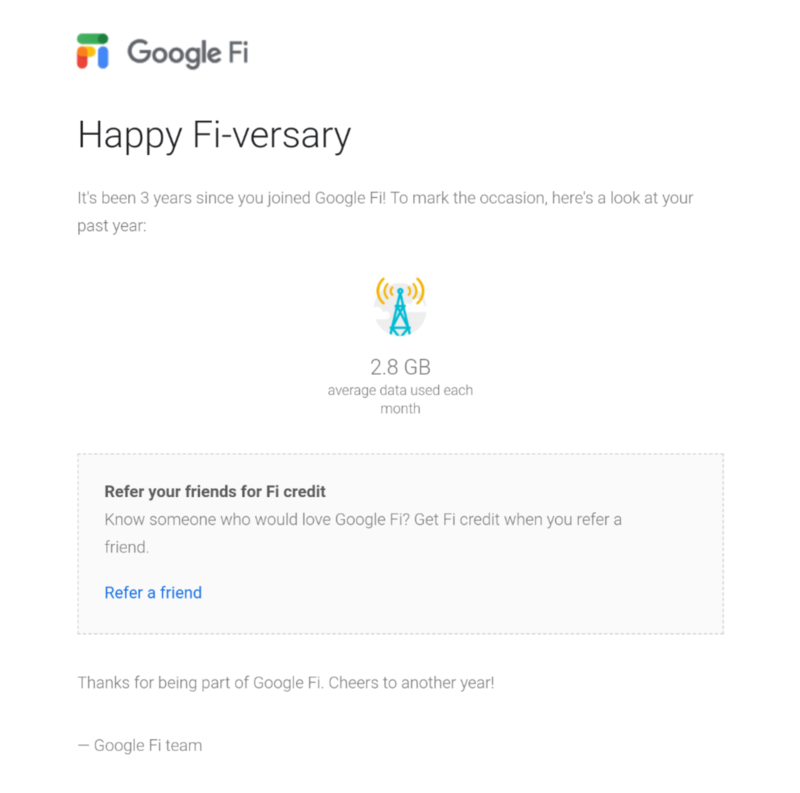 After 2.5+ years as a loyal GoogleFi I still want love GoogleFi and the Google phones but support is making it hard to do. This isn't true. I do have data. OnePlus phones work on Fi? Visual Voicemail on Samsung since Pie update?